Box Dimensions (LxWxH) 6.75 x 4.3 x 3.25"
A-Box Audio Distribution Adapter Box for ARRI ALEXA Mini is rated 4.5 out of 5 by 2. Rated 5 out of 5 by Cine-Evolution.com from Yes without hesitation ! 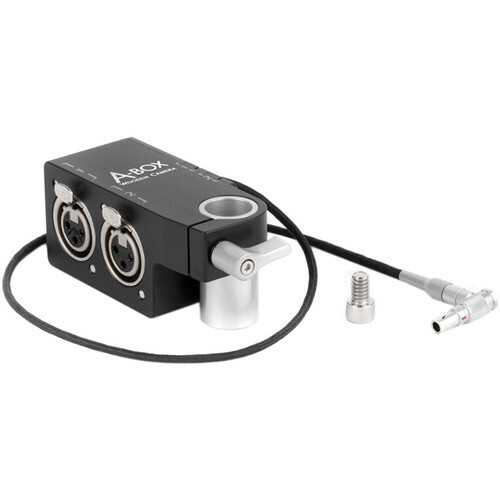 As Arri does not market an audio input solution for the Alexa MINI, I have found this to be the best on the market. It was also recommended by a tech colleague from Panavision. Rated 4 out of 5 by Adam from Another solid bit of kit from Wooden Camera. Another solid bit of kit from Wooden Camera. Will either channel 1 or 2 record audio in stereo? or channel 1 = left channel only, and channel 2 = right channel only in mono? Hi James. The A-box sends two independent channels. It is up the the setting in the camera how these are used, so check your settings, but it is wired as two independent tracks. Can I connect a line directly through a mixer or a sennheiser receiver? Hi Tatiana. Yes, to record editing-quality sound, you can connect a mixer or Sennheiser receiver to one of the 3pin XLRs of the A-Box to then send a line level to the camera.